WARNING: This product can expose you to chemicals including Di(2-ethylhexyl)phthalate (DEHP) and Lead, which are known to the State of California to cause cancer, and Di(2-ethylhexyl)phthalate (DEHP), Lead and Bisphenol A (BPA), which are known to cause birth defects or other reproductive harm. For more information go to www.P65Warnings.ca.gov. Stage piano with stand, bench, pedal, headphones and gig bag. 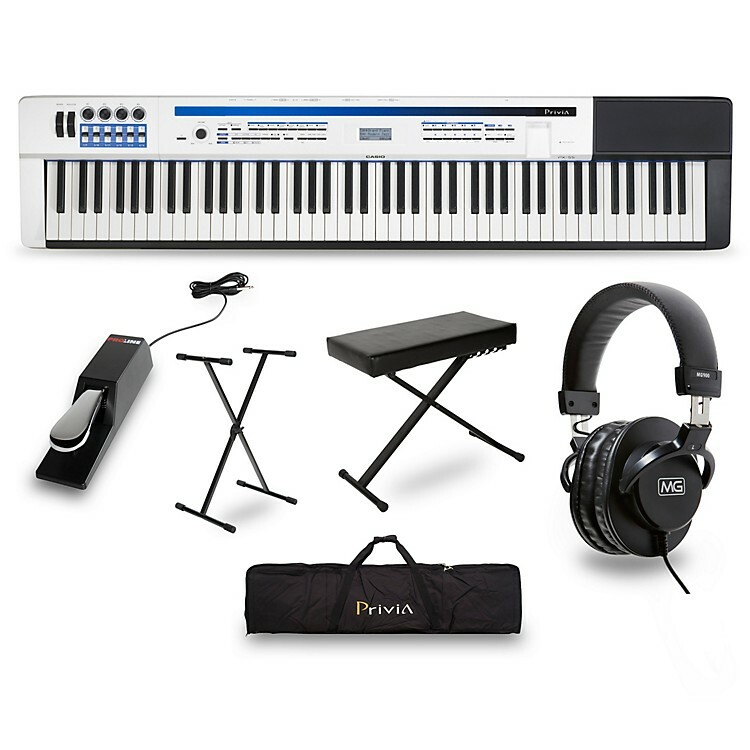 An exciting and thoroughly complete piano package, this features the Casio PX-5S, a magnificent home digital piano, along with essential accessories. The PX-5S is part of the Casio Privia line of digital pianos. The PX-5S is loaded with a collection of acoustic pianos, vintage keyboard, and synth sounds, and has powerful controller features and sequencing tools that sets it apart from other keyboards. At the heart of the PX-5S Stage Piano is Casio's proprietary AiR sound source which provides incredible realism, detail and expression for grand piano sounds. In the PX-5S, the power of AiR has been expanded to provide stunning fidelity and control over other instrument tones and effects with 256 notes of polyphony. This protective carrying bag for Casio Privia Pianos features the Privia logo, carrying handles, and a shoulder strap. The Musician's Gear Deluxe Keyboard Bench is an X-style folding throne that features supreme comfort from heavy padding and great stability from rubber foot stabilizers. The height is adjustable from 21-1/4" to 25-3/4" and it is 23-3/5" wide. On-Stage Stands KT7800+ Keyboard Bench (450427) The deluxe design combines a 3" cushion that provides deluxe comfort for hours of play. A spring loaded double deadbolt locking mechanism keeps the bench at your desired height with complete peace of mind. Standard sustain pedal with switchable polarity. Larger chassis with rubber skid on the bottom to prevent your pedal from jumping around on hard floors. Silent operation, quality cable. Now you can control your keyboard a more realistic piano feel with a Proline PSS2 Professional Sustain Pedal. Single-braced X-style stand with rubber feet for a steady grip on the floor and rubber skids on the top to hold your keyboard firmly. Adjustable to different heights from standing to seated. Folds up easily for convenient transport.